It is located near about ten kilometers up from Chemre in the Chemre Valley. The meaning of tak thok is rock hood and it refers to cave chapel found in gompas. The lamas of this monastery belongs from Tibet and they are highly respectable personalities among the Ladakhis. It means the ladakhis pay huge respect to them. The monastery is a house of 55 lamas of the Nying-ma-pa sect of Buddhism famously known as "Old Order". The members of this sects are highly inspired by the Padme Sambhava's teachings and Tak thok is the only gompa which preaches this order. Entering the main courtyard, one is immediately struck by the rock outcroppings that surround the gompa. Indeed, the wooden front of the chapel is only a front for the cave behind it and most of the gompa consists of rooms hollowed out of the stone cliff either by nature or man. The cave chapel is to the left as one enters the central courtyard. A small anteroom to the cave chapel has been recently painted with the Guardian Divinities of the Four Directions. In the front of the cave chapel are images of Padme Sambhava and Avalokitesvara (analogous to the Hindu god Shiva and easily recognizable by his eleven heads and 1,000 arms). Behind this image is a small locked door leading to the small cave where Padme Sambhava is supposed to have lived and meditated for three years. This cave is not open to the public. 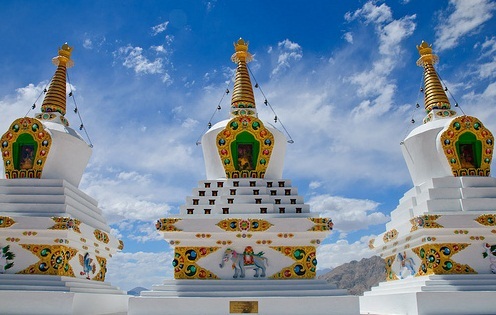 Ladakh has an ample of monasteries including Phyang Gompa, Sankar Gompa, Spitok Gompa, Stok Gompa, Stokna Gompa, Thiksey Monastery Matho Gompa, Likir Monastery and so on. One of the similar quality of all these monasteries is that they are perfect place to regain the peace of your mind as their surroundings is so calm and peaceful. Places of worship have a peaceful feeling about them. And when that peace is accentuated by heavenly surroundings, a person feels one with God. 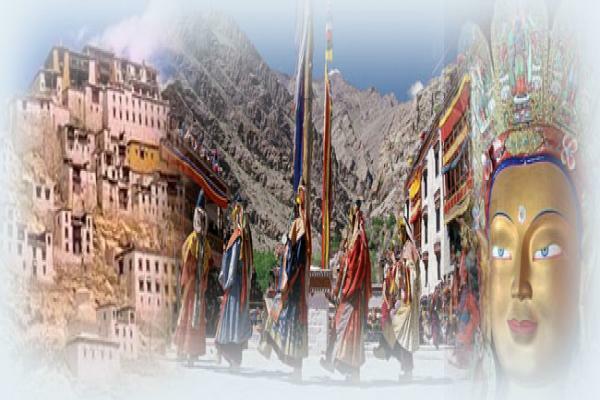 Ladakh is home to natural beauty and alongwith that, a large number of Godly abodes. There are several Buddhist monasteries in Ladakh with great architecture. 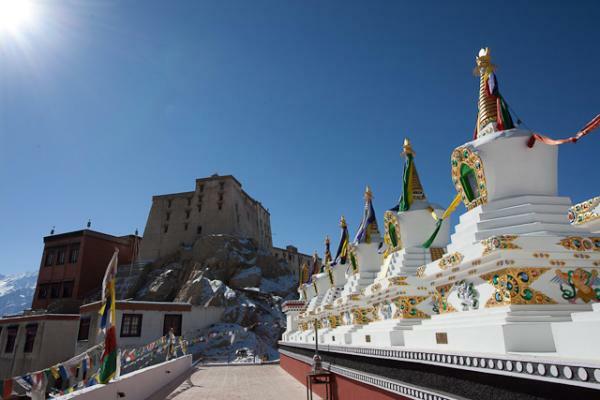 Many of these famous monasteries in Ladakh have interesting inception. Karsha Gompa is the largest monastery located in picturesque surroundings of Zanskari town. Its full name is Karsha Chamspaling. Phagspa Shesrab is the founder of this monastery. Shesrab Zangpo of Stod was the first person who introduced the Gelukpa Order in the Karsha Gompa of Leh Ladakh.The monastery consists of ample of shrines, wall paintings, splendid work of Buddhist art and culture. There are many monasteries in Ladakh. These monasteries in Ladakh India are built with great design. Ladakh’s culture is affected by culture in Kashmir Valley and Tibet. One of the famous monasteries in Ladakh is the the Shey Monastery. It is one of the tourist attractions in Ladakh. One amongst the famous Buddhist monasteries, Shey monastery is situated 15 kms to the south of Leh. In 1655, king Deldon Namgyal built this splendid monastery in the memory of his father Singay Namgyal. Inside the monastery there is a huge statue of Buddha Shalyamuni -the second largest statue of Buddha in Ladakh. The statue is made up of copper sheets and decorated with gold. It was constructed by Teldan Namgyal. Two chief disciples of Buddha, namely Sariputra and Maudgalyayana are painted on the back side of the statue. On both the sidewalls of the Buddha statue, are displayed the 16 Arhats (Worthy Ones who have achieved Nirvana), eight being on each side. In front of the statue, a large bowl of wax with a central flame is placed which is a sign of divinity and purity. On the 30th day of first month of Tibetan calendar an annual festival is organized here. Lamayuru is located on the Srinagar-Kargil-Leh in Kargil district. It is amongst the oldest monasteries of ladakh built in 10 century. Lamayuru is belongs to the red hat sects of Buddhism. It was established by Mahasiddhacharya Naropa. Historically, it is believed that lamayuru was once a lake. The story behind it is that a Lama(Buddhist Monk) once blessed the place as a result the water of the lake disappeared and it left the place for the monastery to be built. Earlier there were 400 lamas were living but now their number reduced to 30 to 50. 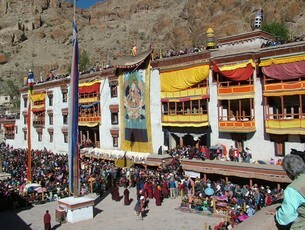 In the second and fifth months of Tibetan calendar, all the lamas gathered together for general prayer in the monastery. It consists of five magnificent buildings, all are damaged except the central one. It has a incredible collection of artifacts including wall paintings and thankas, statues and carpets. Places of worship have a peaceful feeling about them. And when that peace is accentuated by heavenly surroundings, a person feels one with God. Ladakh is home to natural beauty and alongwith that, a large number of Godly abodes. There are several Buddhist monasteries in Ladakh with great architecture. Many of these famous monasteries in Ladakh have interesting inception. Hemis gompa is established in 1620 by Lama Tagstang Raspa and built by Palden Sara under the patronage of King Singe Namgyal. It is located at about 50 km away from the Leh city. The entrance door leads to a open courtyard to its right there is a sanctum sanctorum. On the walls are installed the prayer wheels canopied by red coloured wooden ceiling. The gompa is a tall one led by steep stairs, on the sides of which are two wooden pillars with artwork on the ceiling. Two storey wooden balcony could also be seen on front facade of Gompa. You can see a monk sitting silently and there are benches painted red, meant for prayers. You can also see many offerings by the devotees like colorful bands, money in different currencies and dry fruits. Just outside the door, there is a stairway leads up to another temple which has a some delightful statues of some Buddhist legend. From there you can entered the terrace of the gompa to have a panoramic view of the surrounding mountains. On the otherside of the courtyard, you can find some ancient paintings of Buddha's incarnations. The best part of gompa is that it offers the peace of mind as the surrounding atmosphere so calm and peaceful. Photography is strictly prohitbited inside the museum. Gods are housed in beautiful temples, churches, monasteries, mosques etc. But we know that God is omnipresent. The tiny population is Ladakh has Tibetan and Buddhist beliefs. They do believe in the presence of God in all living things. However, true to any other culture, they have built several places of worship in Ladakh. The Buddhist monasteries are testament to this fact. There are several beautiful monasteries in Ladakh. It is situated in the Numbra Valley(valley of flowers) of Ladakh,and also accessible with one of the largest motorable roads in the world - Khardung la (18,500 feet/5,600 m). The tallest statue of Lord Buddha (106 foot tall) stands right on the top behind Diskit monastery, it took 6 years to complete and near about 30 millions of rupees spent in its construction. There is a huge collection of temples like Kangyu-lang, Tsangyu-lang, etc inside its complex . It is believed that the sworn enemy of Buddhism -Mongol demon once lived here. He was defeated near the monastery. Even after his death his body come back again and again inside the monastery. It is said that even today the wrinkled head and hand of the demon lie inside a temple of the monastery. Known to be a peaceful and quiet place, Ladakh is home to severala famous monasteries. 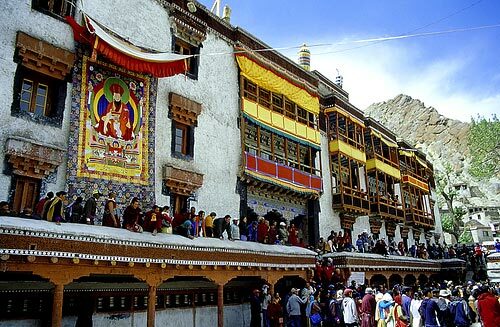 The Buddhist monasteries in Ladakh are very old and each have their historical significance. Alchi Monstery also known as Alchi Choskhor is located in a small village named Alchi, which is about 67 km away from Leh. It is the oldest monastery in Ladakh, one of the most significant feature of this monastery is that it is situated on a flat ground surface. It has two main temples -Alchi Du-khang and the Sum-tsek. Besides this it has some other smaller structures including The Temple of Manjushri, LotsawaLha-khang, Lha-khang Soma and 3 Ka-ka-ni (entrance) chortens. The main credit for constructing it goes to the great translator RinchenZangpo (958-1055). It is necessary for the tourists to carry a flash light with them as there is no electricity inside it. Photography is strictly prohibited inside it. Copyright © Leh Ladakh Tour India, 2014. All rights reserved.